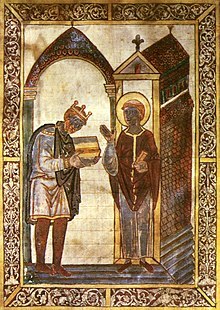 Æthelstan presentin a beuk tae St Cuthbert. Illustration in a gospel beuk presentit bi Æthelstan tae the saunt's shrine in Chester-le-Street, the earliest survivin portrait o an Inglis keeng. He wore a croun o the same design on his "crouned bust" coins. Athelstan or Æþelstān (c. 895 – 27 October, 939), cried the Glorious, wis the Keeng o Ingland frae 924/925 tae 939. He wis the son o Keeng Edward the Elder, an nevoy o Ethelfleda (Æthelflæd) o Mercia. Æthelstan's success in securin the submission o Constantine II, Keeng o Scots, in 927 throu tae the Battle o Brunanburh in 937 led tae his claimin the teetle "Keeng o aw Breetain". His ring is aften owerleuked, wi a hantle focus gang tae Alfred the Great afore him, an Edmund efter. Houaniver, his ring wis o fundamental importance tae political developments in the 10t century. Wikimedia Commons haes media relatit tae Athelstan of England. This page wis last eeditit on 2 October 2015, at 19:08.